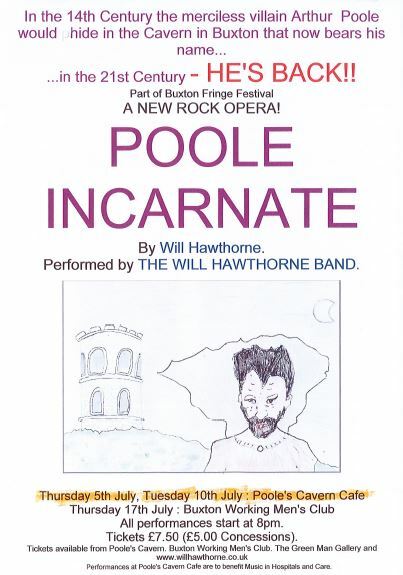 The cafe at Poole's Cavern are hosting a brand new Rock Opera, written by local musician and performer, Will Hawthorne, about the merciless 14th Century villain Arthur Poole who used to hide his ill gotten gains in Poole's Cavern. If you click on the links below you can have a sneak preview of the opera. All proceeds go to the Charity Music in Hospitals and Care. Nine o’clock on a Saturday morning can be a challenging time to attend a talk, but this was very well attended and is a testament to the popularity of the natural world and the power of Mark Cockers writing. In the beautiful and calming setting of St Johns Church and taking the now familiar conversational format, Mike Monaghan Chair of Buxton Civic Association, who were sponsoring the event, discussed with Mark Cocker some of the topics that Mark had covered in his many books, from the damage that colonial Britain has done to indigenous populations, to the devastating effects of man on the environment and the oceans, and of course the joy and pleasure gained from the natural environment. Mark has written about Birds on a continental scale right down to the local, and the micro habitats of Lightwood where his love of the natural world was first kindled. His passion and a thirst for knowledge about the environment began with the observation of some brown birds at the end of the road where he was brought up, Lightwood road, in Buxton. Curious about them, he overcame his fear of being labelled a bird watching nerd and borrowing his brother's binoculars rushed out to see what these unremarkable dull looking birds were all about. Of course, they were far from unremarkable and dull, and close observation of them revealed that they were all slightly different, they were all individuals. This fostered a love and respect for the commonplace, and his most successful book ‘Crow Country’ celebrates the everyday birds that we take for granted, the rook, revealing them to be a fascinating, intelligent, gregarious and much-misunderstood bird. Shot in their thousands as a perceived threat to game estates, they are, we are discovering, among the most intelligent animals on the planet. But of course, not everything we do is bad for the landscape. The RSPB reserves provide sanctuaries and protection for some of our most threatened species and gardeners everywhere play host to a range of species both common and rare. The problem though is that the bad things we do greatly outweigh the good. There is also a fundamental disconnect between the expectation of continuous economic growth and the finite nature of the planet and its resources. Our oceans and the animals that rely on it and live in and around it are choking under mountains of plastics, and essential habitats, woodlands, forests, savannah are being destroyed as we seek to feed an ever-increasing population. Animals that we once could take for granted, Lions, Elephants, Giraffes are everywhere under threat. Perhaps it is not too late. But we need to take a long view. It has taken 150 years to seek equality between the sexes and still, as the latest BBC pay revelations reveal we are not there yet, and it will take a similar timescale to make the environment and its protection second nature. But perhaps we do not have 150 years? Mark is still writing and his next book due out next April is titled ‘Our Place’. It is a personal history of the environmental movement, focusing on six landscapes in the United Kingdom. Let’s hope that he can be persuaded to come back to the BIF 2018 to tell us about it.